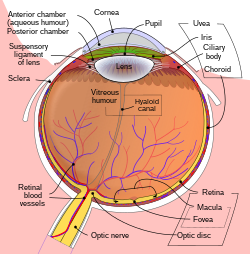 The vitreous body lies at the back of the eye, between the lens and the retina. The vitreous humor is a transparent, colorless, gelatinous mass that fills the space in the eye between the lens and the retina. It is surrounded by a layer of collagen called vitreous membrane separating it from the rest of the eye. it makes up four-fifths of the volume of the eyeball. The vitreous humour is fluid-like near the centre, and gel-like near the edges. The vitreous humour is in contact with the retina. 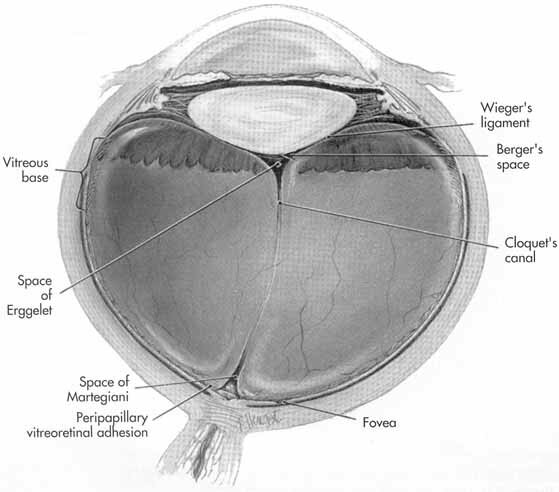 Collagen fibrils attach the vitreous at the optic nerve disc and the ora serrata (where the retina ends anteriorly), at the Wieger-band, the dorsal side of the lens. The vitreous also firmly attaches to the lens capsule, retinal vessels, and the macula, the area of the retina which provides finer detail and central vision. Aquaporin-4 in Müller cell in rats transports water to the vitreous body. 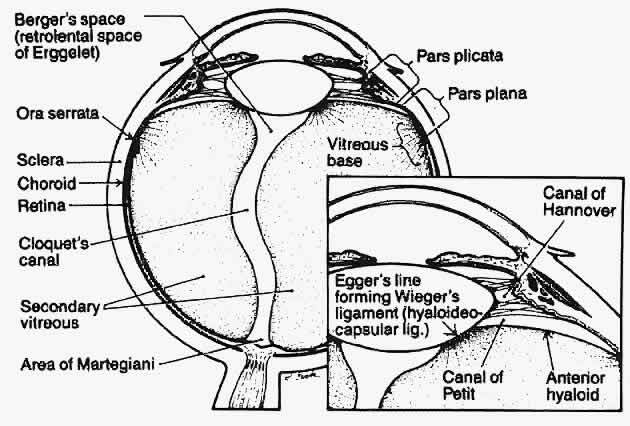 The vitreous has many anatomical landmarks, including the hyaloid membrane, Berger's space, space of Erggelet, Wieger's ligament, Cloquet's canal and the space of Martegiani. Cloquet's canal: A 1–2 mm wide canal within the vitreous, from the space of Martegioni to the space of Berger, along an S-shaped course mainly below the horizontal. Mittendorf's dot: A small circular opacity on the posterior lens capsule, which represents the site of attachment of the hyaloid artery before it subsequently regressed. Bergmeister's papilla: A tuft of fibrous tissue at the optic disc, which represents a remnant of the sheath associated with the hyaloid artery before it subsequently regressed. The vitreous body at birth is homogenous with a finely striated pattern. With early aging the vitreous develops narrow transvitreal "channels". The cortex is denser than the centre with development. From adolescence, vitreous tracts form from anterior to posterior. These vitreous tracts are fine sheet-like condensations of vitreous. Its composition is similar to that of the cornea, but the vitreous contains very few cells. It is composed mostly of phagocytes, which remove unwanted cellular debris in the visual field, and hyalocytes, which turn over the hyaluronan. The vitreous humour contains no blood vessels, and 98–99% of its volume is water (as opposed to only 75% in the cornea). In addition to water, the vitreous consists of salts, sugars, vitrosin (a type of collagen), a network of collagen type II fibrils with glycosaminoglycan, hyaluronan, opticin, and a wide array of proteins. Despite having little solid matter, the fluid is substantial enough to fill the eye and give it its spherical shape. The lens, on the other hand, is tightly packed with cells. The vitreous humour has a viscosity two to four times that of water, giving it a gelatinous consistency. It has a refractive index of 1.336. The vitreous fluid is not present at birth (the eye being filled with only the gel-like vitreous body), but found after age 4-5, and increases in size thereafter. Produced by cells in the non-pigmented portion of the ciliary body, the vitreous humour is derived from embryonic mesenchyme cells, which degenerate after birth. The nature and composition of the vitreous humour changes over the course of life. In adolescence, the vitreous cortex becomes more dense and vitreous tracts develop; and in adulthood, the tracts become better defined and sinuous. Central vitreous liquefies, fibrillar degeneration occurs, and the tracts break up (syneresis). Unlike the fluid in the frontal parts of the eye (aqueous humour) which is continuously replenished, the gel in the vitreous chamber is stagnant. Therefore, if blood, cells or other byproducts of inflammation get into the vitreous, they will remain there unless removed surgically. These are known as floaters. If the vitreous pulls away from the retina, it is known as a vitreous detachment. As the human body ages, the vitreous often liquefies and may collapse. This is more likely to occur, and occurs much earlier, in eyes that are nearsighted (myopia). It can also occur after injuries to the eye or inflammation in the eye (uveitis). The collagen fibres of the vitreous are held apart by electrical charges. With aging, these charges tend to reduce, and the fibres may clump together. Similarly, the gel may liquefy, a condition known as synaeresis, allowing cells and other organic clusters to float freely within the vitreous humour. These allow floaters which are perceived in the visual field as spots or fibrous strands. Floaters are generally harmless, but the sudden onset of recurring floaters may signify a posterior vitreous detachment or other diseases of the eye. Posterior vitreous detachment: Once liquid vitreous enters the sub-hyaloid space between vitreous cortex and retina, it strips the vitreous cortex off the retina with each eye movement. After death, the vitreous resists putrefaction longer than other body fluids. The vitreous potassium concentration rises so predictably within the hours, days and weeks after death, that vitreous potassium levels are frequently used to estimate the time since death (post-mortem interval) of a corpse. The metabolic exchange and equilibration between systemic circulation and vitreous humour is so slow that vitreous humour is sometimes the fluid of choice for postmortem analysis of glucose levels or substances which would be more rapidly diffused, degraded, excreted or metabolized from the general circulation. ^ a b c d Susan Standring; Neil R. Borley; et al., eds. (2008). Gray's anatomy: the anatomical basis of clinical practice (40th ed.). London: Churchill Livingstone. ISBN 978-0-8089-2371-8. ^ Retina and vitreous. American Academy of Ophthalmology (2017-2018 ed.). San Francisco, CA. ISBN 9781615258185. OCLC 1003266782. ^ Sim?, Rafael; Villarroel, Marta; Corraliza, L?dia; Hern?ndez, Cristina; Garcia-Ram?rez, Marta (2010). "The Retinal Pigment Epithelium: Something More than a Constituent of the Blood-Retinal Barrier? Implications for the Pathogenesis of Diabetic Retinopathy". Journal of Biomedicine and Biotechnology. 2010: 190724. doi:10.1155/2010/190724. PMC 2825554. PMID 20182540. ^ a b c d e f g h i j k l m n o "Biochemical analysis of the living human vitreous". ResearchGate. Retrieved 2016-03-09. ^ a b c d e f g h i j k l m n o p q r s t u v w x y Murphy, William; Black, Jonathan; Hastings, Garth (11 June 2016). Handbook of Biomaterial Properties. Springer. ISBN 9781493933051 – via Google Books. ^ "Manganese in the Human Vitreous". ResearchGate. 1 March 2016. ^ Velpandian, Thirumurthy (29 February 2016). Pharmacology of Ocular Therapeutics. Springer. ISBN 9783319254982 – via Google Books. ^ Zilg, B.; Bernard, S.; Alkass, K.; Berg, S.; Druid, H. (17 July 2015). "A new model for the estimation of time of death from vitreous potassium levels corrected for age and temperature". Forensic Science International. 254: 158–66. doi:10.1016/j.forsciint.2015.07.020. PMID 26232848. ^ Kokavec, Jan; Min, San H.; Tan, Mei H.; Gilhotra, Jagjit S.; Newland, Henry S.; Durkin, Shane R.; Casson, Robert J. (19 March 2016). "Antemortem vitreous potassium may strengthen postmortem interval estimates". Forensic Science International. 263: e18. doi:10.1016/j.forsciint.2016.03.027. PMID 27080618. ^ "Postmortem Vitreous Analyses: Overview, Vitreous Procurement and Pretreatment, Performable Postmortem Vitreous Analyses" – via eMedicine.